With some species native to Australia, Pterostylis Orchids are also found in New Zealand and New Guinea, and are a terrestrial orchid, that is they are of a deciduous nature. Often referred to as ‘Greenhoods’ they are a fascinating group of plants that can be grown in the garden where they will naturalize in time. With over 200 species, not all from Australia the genus has a lit of similarities from species to species, however subtle differences in colour and flower size are distinguishing features. Most are given common names that refer to the form of the plant and flower, so P.curta is known as the Blunt Greenhood, while P. nutans is the Nodding Geeenhood. Active growth begins in late summer, usually brought on by rains, foliage grows over autumn and winter and flowering is in spring. By early summer they are dormant again. Often grown in containers they do make a wonderful display with the fascinating nodding heads that appear from Winter to Spring. Pterostylis baptistii is from areas around Brisbane and is typical of the greenhoods in flower form. 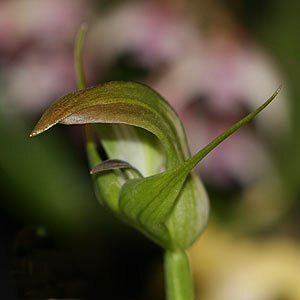 The Greenhood Orchids are Pterosylis species and with over 300 species in the genus, these are terrestrial orchids, many of which can be grown in cultivation. One of the easiest is Pterostylis curta, and this is the species we recommend to start with. Container growing to start with and make sure the pots are lifted off the ground to help avoid the snail and slug problem. They grow naturally is open woodland, this means dappled shade or filtered light. We suggest a shade house or 50% – 75% shade cloth, depending on little on climate and position. Given good soil, which means free draining and with some moisture, they can be grown in the ground in many areas, however snails and slugs are a problem in many gardens. Pot culture is more common, and a specialist native potting mix, with a little perlite mixed through is a good starting mix. A good quality every day potting mix, again with some perlite mixed through also works for many growers. The perlite improves the drainage, which is important. The plants are best repotted every second year. This will refresh the growing medium and prevent the mix from breaking down and becoming to wet. Keep the growing medium moist when the plants are in active growth. Generally start watering around late summer to autumn. Do not allow the pots to dry completely, as these plants grow from underground tubers, if allowed to dry completely they will die. Cut back on water and allow the soil to dry after flowering. In terms of fertiliser, very little will be needed. A light application of seaweed fertiliser as the foliage appears can be beneficial. 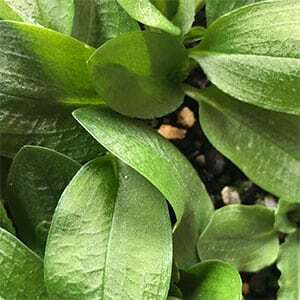 Some growers use a little aged cow manure, again as the foliage appears, however only a little, around a tablespoon to a 6 inch pot once a year. They are summer dormant, so hold back on water during this period unless it is very dry. Commence watering in mid summer with light watering each week. As soon as new growth appears, water regularly, however never allow the pots to become wet and soggy. P. alpina is commonly called the Mountain Greenhood, it usually grows in smallish clumps. White flowers with green stripes, reaching around 30 cm. Flowering in early to mid spring. P. pedunculata is known as the Maroon Greenhood, Green and white flower with a maroon colouring on the top. P. melagramma is known as the Tall Greenhood, its natural habitat is close to the trunks of Eucalypts. A taller flower spike than most, a number of green and white flowers on each flower spike appear very early in spring. P. acuminata found in moist area and coastal areas. P. despectans is also very rare. P. grandiflora is the ‘ Superb Greenhood’. Other Australian terrestrial orchids include Spiranthes and Thelymitra.